World Poetry Day: Poets Urged To Take Advantage Opportunities In The Creative Field. As the world celebrates the World Poetry Day today, poets in Nigeria have been called upon to expand their coast in creativity and take advantage of the numerous opportunities that abound in the field. The National President of Poets In Nigeria, Mr. Eriata Oribhabor gave this charge in an interview with National Light, on what should be the expectation of the people for the day. He noted that numerous opportunities abound nationally and internationally for poets, especially the younger ones, categorically highlighting some of them as award opportunities, publication opportunities, workshop opportunities, among others. Elaborating on the significance of the day, the bard noted that the day is celebrated to acknowledge and popularize the beauty and role of poetry in every culture and every country of the planet, even as he confessed the it also helps to breed and entrench people's interest, passion and love for poetry. Mr. Oribhabor further called on the government at all levels, philanthropists, private organizations, well-to-do individuals and art enthusiasts to as a matter of necessity lay their highly needed supports and contributions towards the promotion of poetry in the country, as the role and importance of art in general and poetry in particular to mankind and society can never be overemphasized. On his own part, another crackerjack in the field of poetry and National President of the Association of Nigerian Authors, Mr. Denja Abdullahi described the world poetry day as a day set aside for poetry to be appreciated all over the world and its beauty and role in the life of a man celebrated. Confessing that poetry is the mother of all arts, Mr. Abdullahi noted that the absence of universal theme for marking this year's World Poetry Day as also witnessed in some other years may have been targeted at giving people the freedom to choose themes of their choices that best fit what they want to do in celebration of the day, as according to him, a universal theme may limit the celebration, since every group would be cautious to confine their activities within the enclave of the general theme, whether it suits their country or not. This, he said, justifies and uploads the uniqueness of poetry. He also noted that the day could be celebrated in anyway, with any activity or event, by any group or individual, provided it reflects around poetry, even as he disclosed that virtually all the state chapters of the association (ANA) have lined up the events and activities they will undertake in celebration of the day. 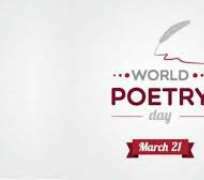 World Poetry Day which comes up on 21st March of every year is a day set aside by the United Nations Education Scientific and Cultural Organization (UNESCO) during her 30th Annual Conference held in Paris in the year 1999 for celebrating poetry all over the world. The day is celebrated to acknowledge the role of poetry in every culture and every country of the planet. The day also recognizes celebrates poetry as the most valuable asset of humane cultures and languages. Every civilization has been practicing some form of poetry which has been integrated into its language and has become an identity of that particular culture. World Poetry Day also admires the role of poetry in bridging cultural differences and bringing communities closer. The day also commemorates the poets for speaking out on cultural and social issues through poetry; inspiring and encouraging millions. Many people celebrate the day in different ways. Some school and colleges around the world organize programs to let the students acknowledge the role of poetry in bridging cultural gaps and also to admire various poets and their efforts to keep the culture and languages alive through poetry. Some schools dedicate a classroom lecture on poetry, during which the children are taught about different forms of poetry and also get to know different poets. Poets are invited for talks and conferences are held at variety of places like – cafeterias, colleges, schools, auditoriums and stadiums etc. Poets even from across the borders are cordially invited to enrich people about their own books and also to express their views. Awards are conferred to those who have contributed commendably in the field of poetry. Exhibitions are also organized at various locations, displaying the works by various national poets as well as poets from across the border. The observance of the day is also meant to encourage a return to the oral tradition of poetry recitals, to promote the teaching of poetry, to restore a dialogue between poetry and the other arts such as theatre, dance, music and painting, and to support small publishers and create an attractive image of poetry in the media, so that the art of poetry will no longer be considered an outdated form of art, but one which enables society as a whole to regain and assert its identity. Read poetry and also try to write it. This way you will not only admire poetry but also be able to express yourself in a more entertaining and rhythmic way. Reading or writing a poetry will not only relieve your stress but also help you to connect to your roots. Spread awareness about the poetry and its various advantages from bringing communities closer to preserving culture and languages. Enlighten someone you know, by telling about various forms and advantages of poetry. You could also gift your family and friend a book by your favorite poet or ask them to write their own poetry. Keep a look out for any gathering organized on “World Poetry Day”. Take out some time to attend the event and to listen to what poets have to say about their works, cultures etc. Try to communicate with people and poets present, to know more about poetry and its forms. Visit the exhibition/s in your city to know about various poets and their works. Poetry exhibitions will also make you familiar to the work of poets from across the world and make you admire their work and efforts. You will also feel getting closer to other cultures across the world and also admire them. There could be a poet or a publishing house in your locality which is struggling from the unavailability of funds. You can donate as per your will contributing into their revival and bringing them back on track. Donating for poetry is like donating to save your own culture and language and ensuring their longevity. As the world marks the 2019 World Poetry today, it is a pleasure to say 'Happy World Poetry' to all poets across the world.